Composed just a week after the Fantasiestücke, the Adagio and Allegro, Op 70 in A flat major, for horn and piano (issued with alternative parts for violin or cello), delighted Schumann when he heard Clara rehearse it with Julius Schlitterlau, first horn in the Dresden Orchestra. 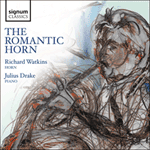 Her response was even more euphoric: ‘A magnificent piece, fresh and passionate, and exactly what I like.’ Originally entitled Romanze, the Adagio is a tender colloquy for the two instruments that exploits both the heights and the depths of the new valve-horn. Schumann gives free rein to the horn’s agility in the Allegro, whose rollicking spirits are stilled in a central episode in B major that recalls the yearning melody of the Adagio. Composé juste une semaine après ces Fantasiestücke, l’Adagio et Allegro op. 70 en la bémol majeur pour cor et piano (publié avec des parties variables pour violon et violoncelle) enchanta Schumann quand il entendit Clara le répéter avec Julius Schlitterlau, permier cor de l’Orchestre de Dresde. Clara fut plus euphorique encore: «Un morceau magnifique, libre, passionné, tout ce que j’aime.» Originellement intitulé Romanze, cet Adagio est une tendre conversation entre les deux instruments, qui exploite les aigus et les graves du récent cor à pistons, à l’agilité duquel Schumann donne libre cour dans l’Allegro. Ce dernier voit son enjouement tempéré dans un épisode central en si majeur rappelant la mélodie languissante de l’Adagio. Lediglich eine Woche nach den Fantasiestücken entstand das Adagio und Allegro op. 70 in As-Dur für Horn und Klavier (und wurde wiederum mit alternativen Stimmen für Violine beziehungsweise Violoncello herausgegeben) und Schumann war erfreut, als er Clara es zusammen mit dem Hornsolisten des Dresdener Orchesters, Julius Schlitterlau, proben hörte. Ihre Reaktion war sogar noch euphorischer: „Ein großartiges Stück, frisch und leidenschaftlich und genau, was mir gefällt.“ Das Adagio, das ursprünglich den Titel Romanze trug, ist ein zarter Dialog zwischen den beiden Instrumenten, in dem sowohl die Höhen als auch die Tiefen des neuen Ventilhorns ausgenutzt werden. Im Allegro lässt Schumann der Beweglichkeit des Horns freien Lauf, dessen ausgelassene Stimmung sich in einer zentralen Episode in H-Dur beruhigt, in der die sehnsuchtsvolle Melodie des Adagio noch einmal zum Ausdruck kommt. Schumann’s Adagio and Allegro, Op 70, was composed in 1849, which the composer described as ‘my most fruitful year’. He had been influenced and inspired by the virtuoso horn player Joseph Lewry. The horn was undergoing a radical transformation with the recent invention of the valve, making the instrument fully chromatic. Although some composers, notably Brahms, were wary of this new-fangled device, Schumann was quick to exploit the advances the valved horn afforded him. As well as the Adagio and Allegro, Schumann also wrote the Konzertstück for four horns and orchestra and a deliciously rich Andante and variation for the unusual combination of horn, two cellos and two pianos. The Adagio and Allegro is a hugely dramatic piece exploiting the range and stamina of the player—there are only seven bars rest in the horn part. 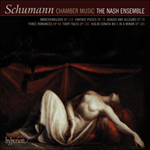 It is generally regarded as one of Schumann’s lovelier chamber music works, so much so that other versions exist for cello, violin and viola.